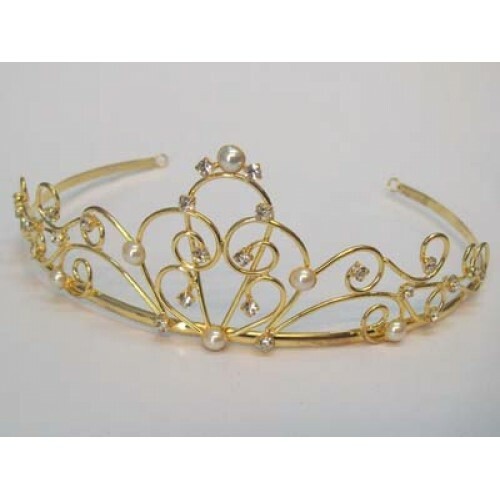 Persephone is a low-rise tiara in a gold finish with dazzling clear diamante gems and pearls, the perfect bridal hair accessory to compliment your wedding dress. A tiara always looks timelessly elegant and stylish, with or without a veil, and is a lovely accessory for bridesmaids too. Our Persephone tiara is just what you need to finish your bridal hair on your special day. A glamourous hair decoration that is sure to become a family heirloom. Decoflora Limited, Registered in England, Company Number 7053110, VAT Registration Number 996 8957 15. Registered Office: Units 6, 7 & 8 Solway Road, Clay Flatts, Workington CA14 3YA. Website Maintained By Tristar Web Solutions Ltd.